The big news here is that Astrid is now diaper free, at least during the day. She’s been wearing underwear at home since October but we weren’t sure how to make the transition at daycare. She would never tell her teachers when she had to go and we didn’t want to burden them with a toddler peeing her pants several times a day. Then suddenly on November 8, she said she wanted to wear underwear to daycare. It caught us by surprise, but we wanted to capitalize on her enthusiasm. So we sent her to daycare with 7 extra pairs of pants, socks, and underwear and pre-apologized to the teachers for the mess she was about to make. We were shocked when she came home in the same pair of pants. Over the next few weeks she had a bunch of accidents and sometimes came home with 2 pairs of wet pants, socks, and even shoes. But she quickly got better at letting someone know when she had to pee, and it’s been a few weeks now since her last accident. 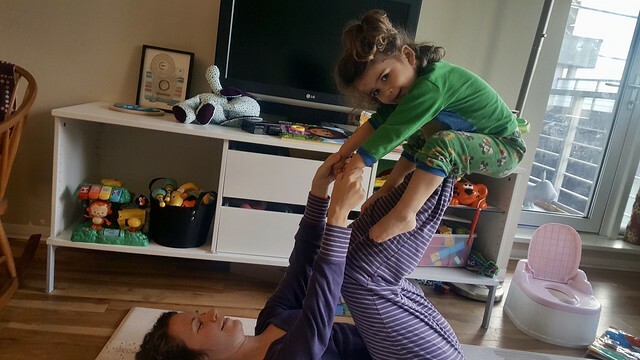 We cancelled our cloth diaper service a few weeks ago and use disposable pull-ups at nighttime. 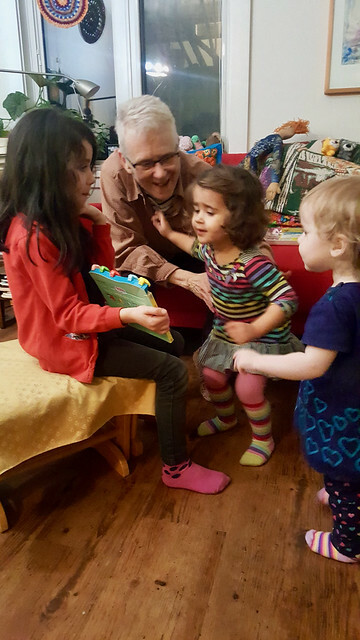 The next big achievement is Astrid had her first sleepover at Grandma’s. Again, we weren’t ready for it but our hand was forced when our only babysitter (Grandma) was under house arrest (backstory) and we had plans to celebrate Emily’s birthday. So we dropped Astrid off after dinner and prayed we didn’t get a phone call to come get her overnight. 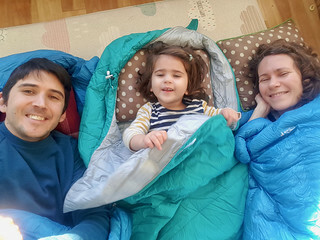 We expected the worst – Astrid hadn’t napped that day and was a bit grouchy, she was still on Ventolin for asthma, and she had been waking up at night coughing and wheezing. But she had fun, slept through the night on the futon, and was brushing her teeth after eating a yummy breakfast when I came by the next morning to pick her up. 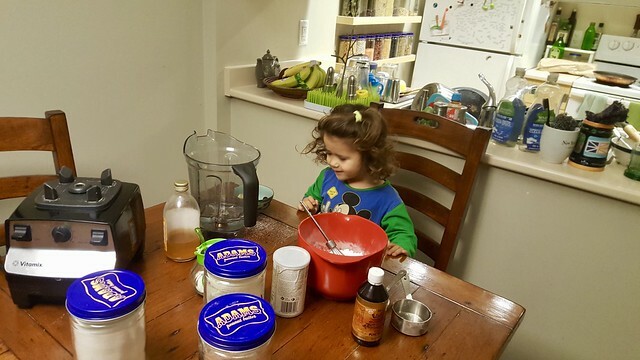 If grandma is up for it, we hope to try it again in the new year. Astrid’s health has been pretty good lately. A few minor colds and the accompanying asthma, but no hospital ER visits. 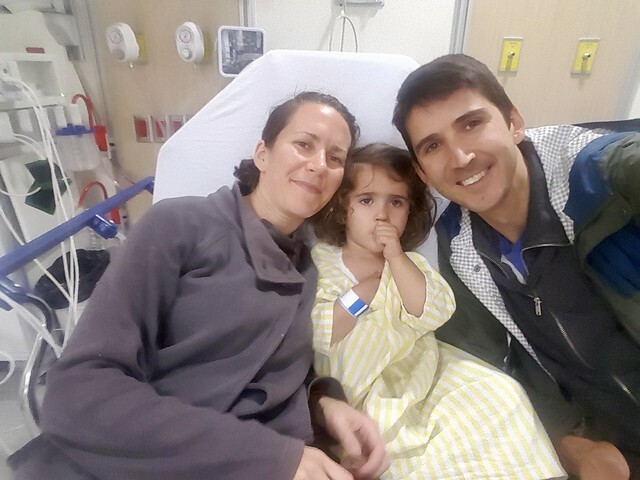 We saw our respirologist and pediatrician, who told us to keep doing what we’re doing. They were impressed with the data and charts I’ve been collecting. The goal is to see less hospital visits and drugs this winter. Astrid loves singing. 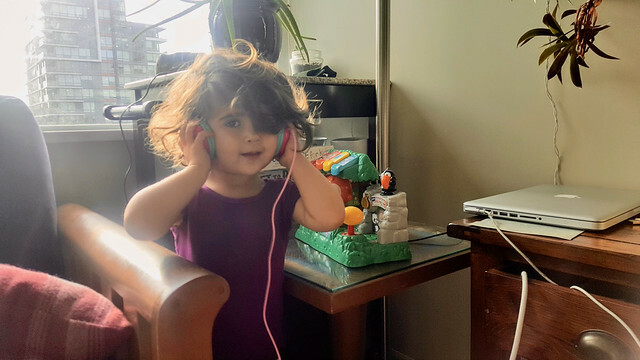 Her favourite songs right now are Puff the Magic Dragon and Frosty the Snowman. 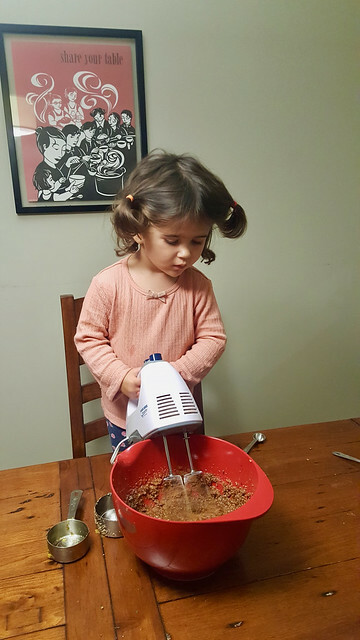 She also likes helping cook and bake, especially pancakes on Saturday mornings and popcorn at night (the perfect snack for a blanket fort). Astrid’s newest obsession is clothing with pockets. She loves having pants, jackets, and shirts with pockets on them. More photos of November and December. Thanks to a healthy peanut butter addiction (I go through a kilogram every 2 weeks), I’ve been steadily acquiring large Adams peanut butter jars that are perfect for storing staples like beans, nuts, and flour. The only problem is our small kitchen doesn’t have enough storage space to fit them all. 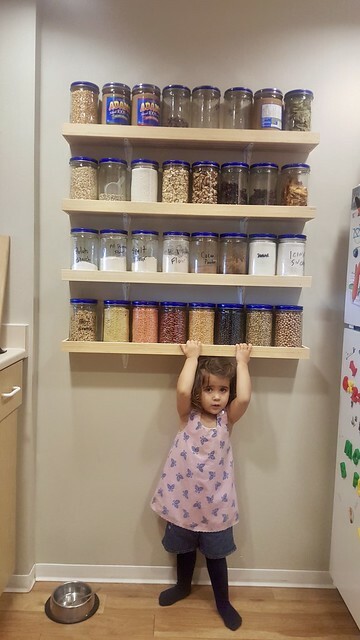 I’ve looked for shelving units online that would fit our jars but have never found any. Luckily my father is a talented carpenter (you can see his other work here) and I sent him the dimensions for the shelves I wanted – wide enough for 8 jars with a 1/2 inch lip around the edge to make sure the jars stay on. 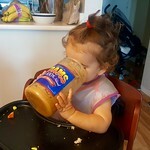 Now we have extra space for 32 easily-accessible jars. They’re perfect for refilling at Nada, our local zero-waste grocery store. It’s November and cold and flu season is officially upon us. That means all the kids at daycare are snotty-nosed germ carriers now. Our doctor told us that Astrid would likely get her first cold in mid-September – two weeks after kids go back to school. And like clock-work Astrid got sick on September 14. Luckily the first cold wasn’t too bad and barely triggered her asthma. A few weeks later she had another cold which took longer to get over. The third (and most recent) moved quickly to her lungs. She was wheezing and coughing, and Ventolin was barely making a difference. 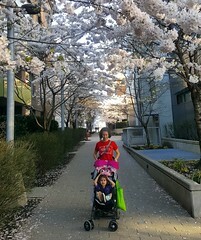 So off to BC Children’s Hospital we went for Astrid’s 9th emergency visit for asthma. 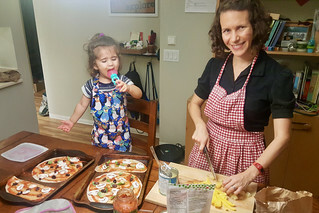 We’ve since started Astrid on a new asthma drug (montelukast) that we’re hoping will get us through the next 5 months of cold and flu season without regular hospital visits. It’s going to be a long winter. 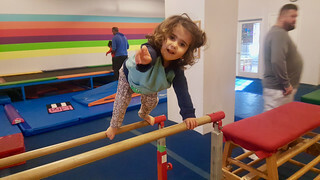 On the positive side, Astrid started gymnastics at the beginning of September and loves it. On Sundays, she gets to jump, swing, and climb for 45 minutes at the gym. Then she comes home does all the same moves in our living room with piles of pillows and our couch as a trampoline. 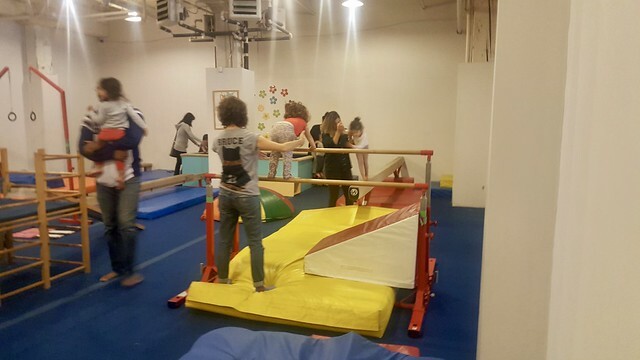 She’s learned to do somersaults and has gotten much better at jumping with two feet and landing with bent knees. Astrid had her first dentist appointment and it wasn’t a complete disaster. I was surprised she let the dentist poke around in her mouth. 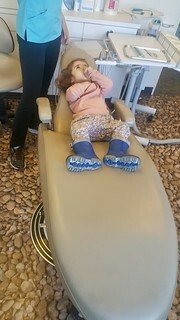 The feedback was mostly positive (she has all of her teeth and no cavities). She needs to stop sucking her thumb before it causes lasting damage, and we should be brushing her teeth twice a day and flossing them too. There is little chance we’ll be able to floss her teeth, but we’ve been more persistent since the dentist that she actually brush her teeth, instead of just sucking on a toothbrush before bedtime. The thumbsucking is going to be a harder habit to break, but we’re working on it. Astrid’s vocabulary has really exploded in the past two months. Unfortunately her pronunciation is lagging. We’ve gone from understanding 90% of what she was trying to tell us to 50%. 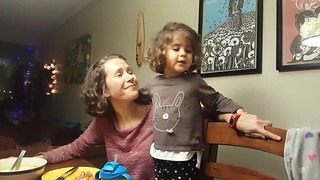 Sometimes it’s like charades – “Astrid I don’t know what that means, can you point and show me?” She also likes to sing and make up new words to her favourite songs. 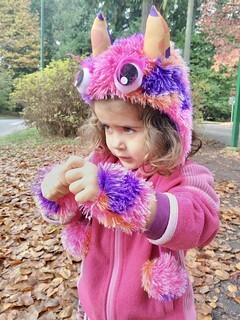 For Halloween Astrid dressed up as a cute monster. This is the first year she understood what was going on. She enjoyed the costumes, riding the ghost train in Stanley Park, decorating a pumpkin, making the hallway spooky, and going trick-or-treating. The hard part is now limiting how much candy she gets. Last year she didn’t eat any of it, but this year she knew what it was. We took away the really sugary stuff and have been letting her have one treat a night. 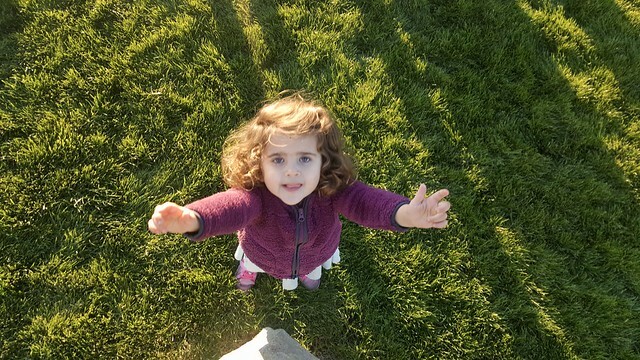 Loves: Jumping on the couch, running around with her daycare friends, building towers with blocks, helping daddy make pancakes on Saturday mornings, and her Mickey Mouse pajamas. Hates: Getting her hair washed or brushed. Mastered: Turning on/off the lights, putting on her jacket by herself. More photos from September, October, and Halloween. Election Day is in 2 days (October 20) and you’re scrambling to figure out who to vote for. Vote for the internet consensus picks. Vote for my recommended candidates. Or vote for one of these prebuilt slates. The first 3 are from Allen Pike’s excellent election guide. Vancouver is about to enter one of the most interesting and uncertain elections in recent history. The mayor and most of the current councillors are not running for re-election, a number of new parties with similar sounding names have formed, and new campaign finance rules are limiting the influence of big moneyed donors like developers. Here is my collection of resources to help you figure out who to vote for. Where to Vote – You can vote at any polling station across the city. Polls are open 8am to 8pm.